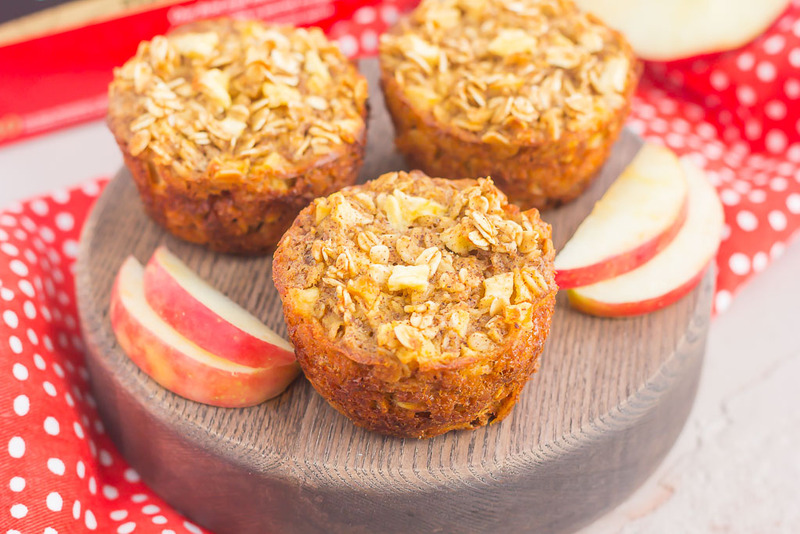 These Apple Cinnamon Baked Oatmeal Cups are the perfect, on-go-the breakfast to enjoy any day of the week. 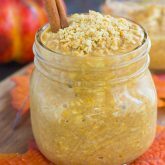 Fresh apples, a sprinkling of cinnamon, and hearty oats make a deliciously cozy dish to enjoy throughout the season! Now that the mornings are getting chillier and fall is in the air, I can’t help but think of warm and cozy breakfasts. Breakfasts that fill you up and entice you to enjoy the season. I will admit that I’m not the best when it comes to eating breakfast during the week. I usually opt for quick options, such as yogurt, cereal, or toast. But, I’m trying to change that. Since my breakfast game is usually strong on the weekends (when time allows), I’ve decided to make a fresh start and carry that tradition through the week. And you know what helps me get my mornings off to a great start? A hot cup of tea. Yes, I always drink coffee, but I’ve been sipping on tea in the mornings, too. Especially now that it’s gotten cooler outside. And my tea of choice is Bigelow. Drinking tea is warm and cozy; it soothes the soul, connects people, invites conversation and makes memories. I’m a huge fan of Bigelow Tea, so when I was shopping at Walmart a few weeks ago, I had to stock up on some of their delicious flavors. 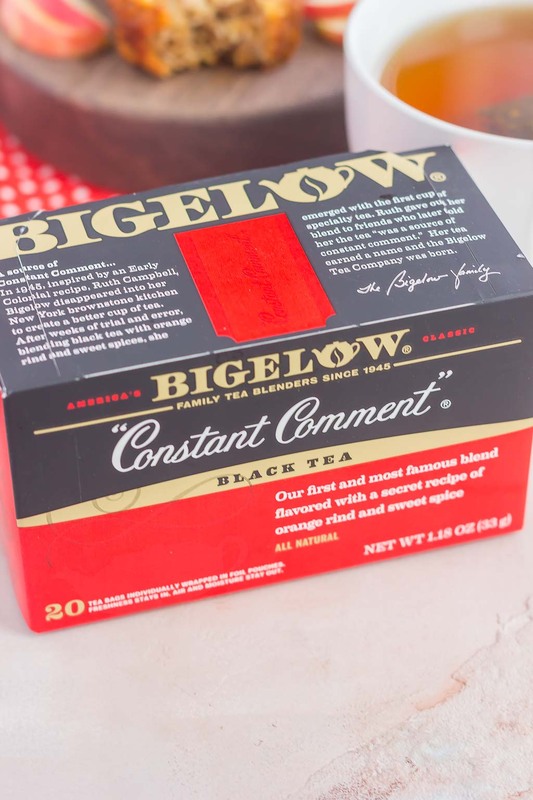 When I drink Bigelow, I “TEA PROUDLY.” Bigelow shares family, three generations, foil packaging, freshness, US manufacturing, quality tea and ingredients. It’s the perfect choice to sip on and also delicious when paired with a cozy fall breakfast. For more information, head over to Tea Proudly and Bigelow. You can also follow along on Facebook, Twitter, and Instagram! Interested in enjoying a hot cup of Bigelow Tea this season? Hover over the photo below to click through to Walmart.com and buy it! After stocking up on Bigelow Constant Comment Tea, I headed home to enjoy a cup and to create the perfect fall dish. And if you’ve been hanging around here long enough, you know that I’m all about the flavors of fall. And what goes better with fall than some apples and cinnamon? I’ve also come to love oatmeal over the years (remember this Savory Oatmeal Breakfast Bowl, those Cake Batter Overnight Oats, or this Strawberry Banana Baked Oatmeal in a Mug? ), so it’s no surprise that I whipped up these Apple Cinnamon Baked Oatmeal Cups. Not only are they on the healthier side, but they’re so easy to prepare and will make your breakfast time a breeze! If you’re struggling to make a fresh start with breakfasts during the week, then look no further. 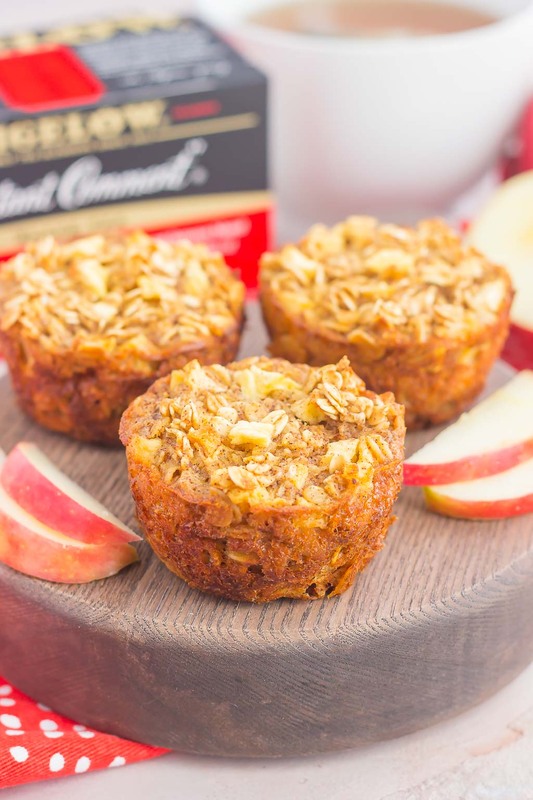 These Apple Cinnamon Baked Oatmeal Cups are perfectly portable, poppable, and so delicious, especially when paired with a steaming cup of Bigelow Tea. 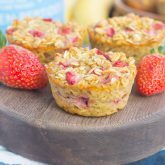 To make the baked oatmeal cups, you’ll start by combining the dry ingredients, such as the old-fashioned oats, a touch of brown sugar, baking powder, cinnamon, and salt. Then, you’ll whisk the milk, eggs, applesauce, and vanilla extract. Mix both the wet and dry ingredients together, and then gently fold in some diced apples. Scoop into a muffin tin and then let the oven work its magic. 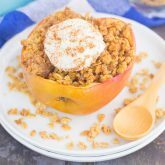 These Apple Cinnamon Baked Oatmeal Cups can be made on the weekend and then refrigerated throughout the week for an easy, grab-n-go breakfast. You could also freeze a big batch of these to eat whenever your craving strikes. The possibilities are endless! 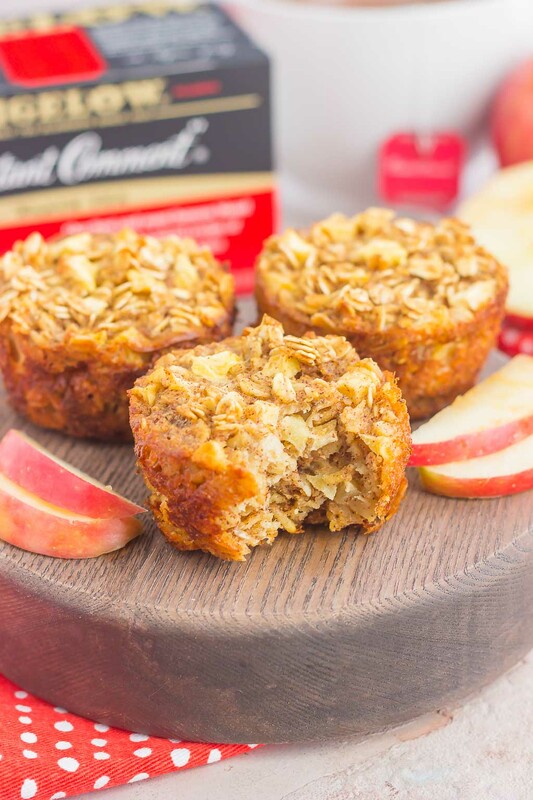 So if you’re ready to savor the flavors of fall, grab those ingredients, along with a cup of Bigelow tea, and whip up these simple Apple Cinnamon Baked Oatmeal Cups! 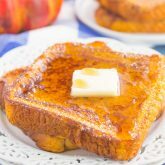 Looking for more easy breakfast ideas? I’ve got you covered! Preheat the oven to 350F. Grease a 12-count muffin tin with non-stick cooking spray. Set aside. In a medium bowl, combine the old-fashioned oats, brown sugar, baking powder, cinnamon, and salt. Set aside. In a large bowl, whisk the milk, eggs, unsweetened applesauce, and vanilla extract. Pour dry ingredients into wet ingredients and stir until thoroughly combined. Gently fold in diced apples. Oatmeal cups can be refrigerated for up to five days or frozen for up to three months. Like what you see? 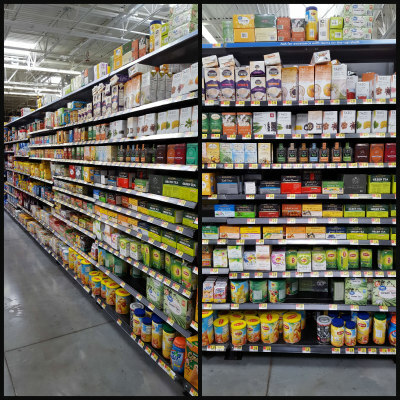 Then be sure to head to your nearest Walmart to check out their selection on Bigelow Tea! That Constant Comment tea has been one of my faves for as long as I can remember. My mom used to buy it (and still does). :) These little baked oatmeal cups look like the perfect companion for a cozy mug! Thanks, Blair! It's a favorite tea of mine, too. Thanks for the sweet comment, Courtney! These oatmeal cups are definitely kid-approved! Thanks, Mira! Tea and oatmeal go so well together! This is just the kind of breakfast I want in the fall! All the apple flavor and warm spices are perfect with coffee OR tea. I've been drinking tea in the evenings a lot now that it's cooler...it's so relaxing! Thanks, Marcie!! I love drinking tea at night too, so relaxing!